CleverCards is a greeting card app that allows you to create and send printed, personalized cards from your mobile. 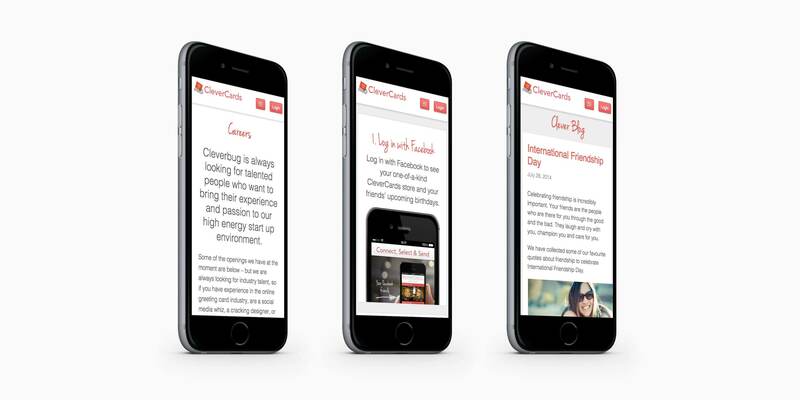 CleverBug, the company behind the app, were launching the concept in the USA and needed a site that was slick, professional and would fit in with Silicon Valley startups while retaining the original warmth of the CleverCards philosophy. 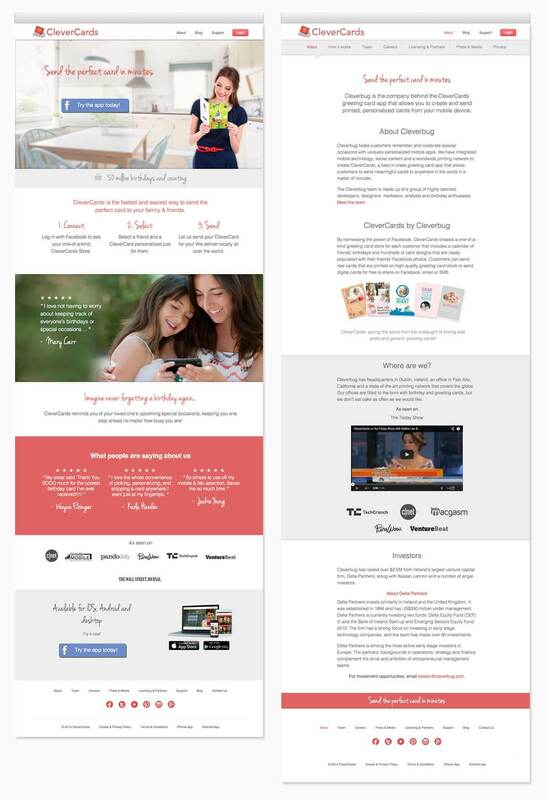 The CleverCards site had a very quick turn around time. Working with the CleverBug developers and building on the existing CleverCards branding, I devised an initial look and feel for the site. My Pixel Design colleague Karen and I colloaborated on the internal pages to produce a friendly yet "techy" website. The site and app went onto to launch successfully in the USA and was selected by Facebook for its annual SMB case study showcase, as well as appearing across various US media outlets. Despite the site being designed in record time, there was still opportunity to add in subtle interactions, details and features, such as using the greeting cards app to place each employee on a card and revealing their information in a neat dropdown. A fully responsive design and build, the inclusion of a constant navigation bar on mobile ensures ease of use for the user.